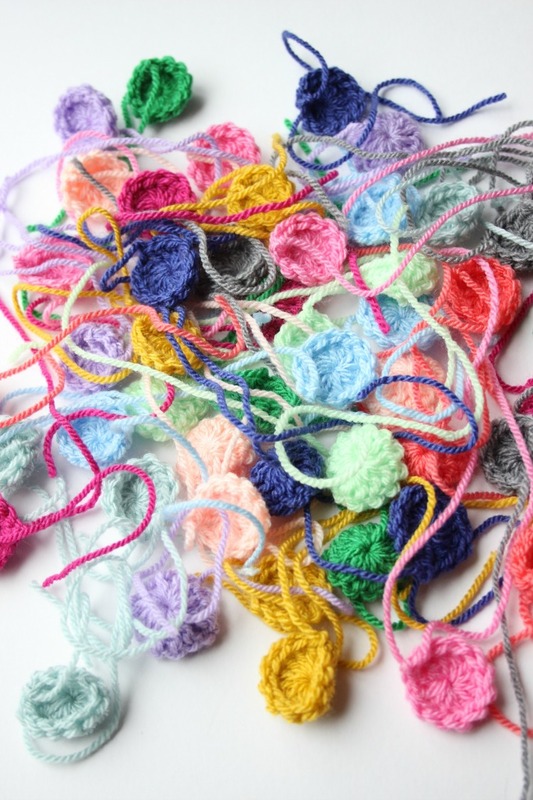 Crafty Crochet Catch Up for Spring. 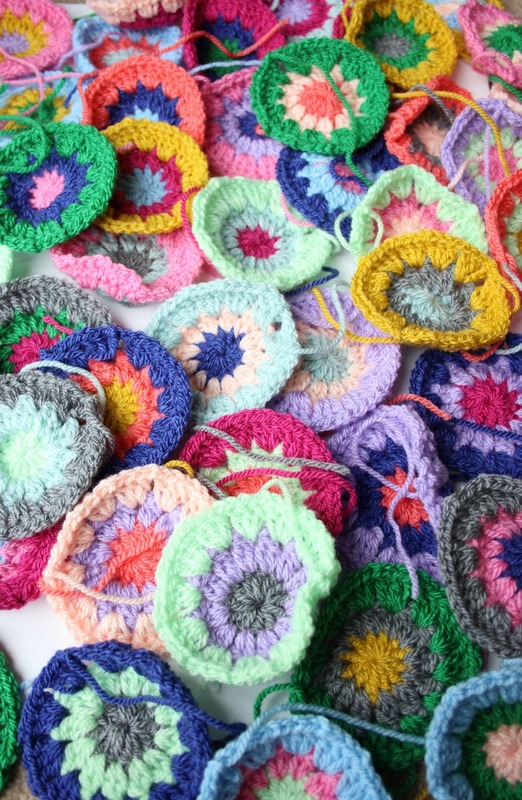 I still had lots of Stylecraft Special dk left from my Crazy Chevron blanket so, on Sunday I made 48 little circles. 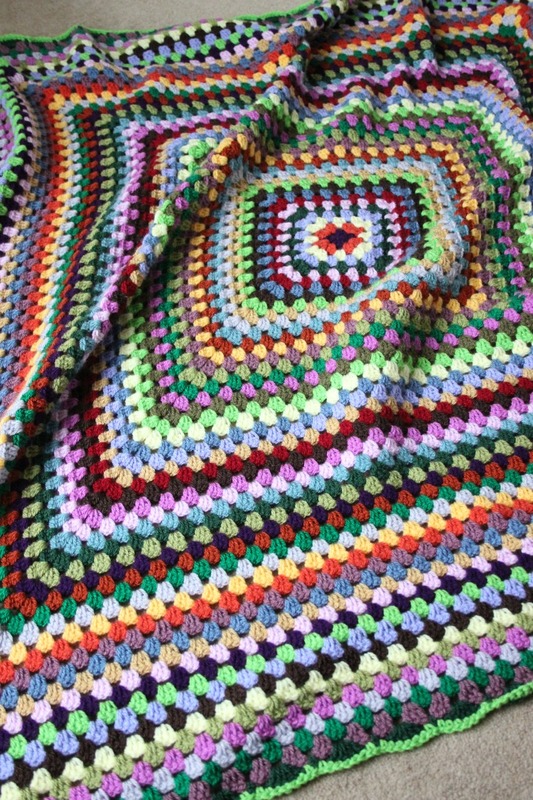 I was thinking baby blanket. I was also thinking of doing a continuous-join-as-you-go. I can’t do one of those though. My guess is that I’d need a minimum of 4 balls of the same colour for that. This is part of an on-going stash busting endeavour and I’m trying to avoid bringing in more yarn. I kind of did buy two extra balls for this already and I’m going to run out of the blue (lobelia) soon. Oh, it’s an instant fail. All 48 circles now have three rounds. 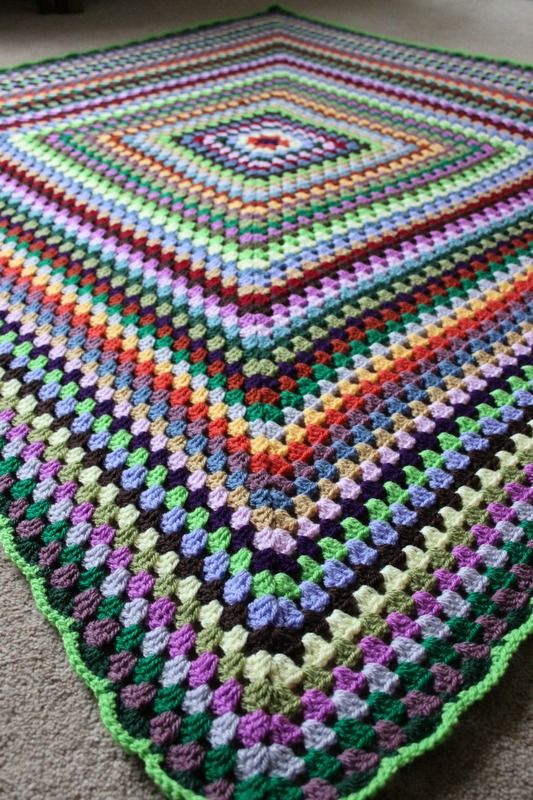 I could square them up to join-as-I-go and use different colours but would it be more interesting to try something new? Eeh, I don’t know, there’s no rush is there? I think I’m going to go for more too. Apart from the lobelia there looks like there’s enough for another 48 circles. Any joining suggestions? At the beginning of last week I got a lovely surprise when Posty brought a parcel to my door. I wasn’t expecting it but I knew instantly who it was from because of the massive label greeting me on the box. 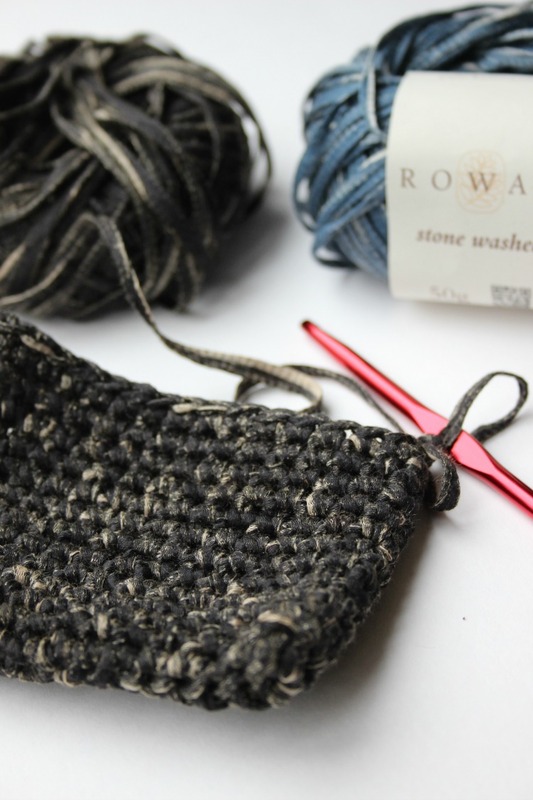 This Rowan Stonewashed yarn was a gift from my friends (I can call them that now can’t I?) at Wool and The Gang. I’ve been lucky enough to have been sent their yarns before. If you fancy checking them out you can read about my mohair experience here. And my gargantuan (yet super warm) scarf here. If I’m being totally honest, the stonewashed is not what I’d normally go for. But they asked me to play with it and that’s what I’ve done. I like it and I’ve enjoyed being coaxed out of my comfort zone. I’m always up for a yarny challenge! 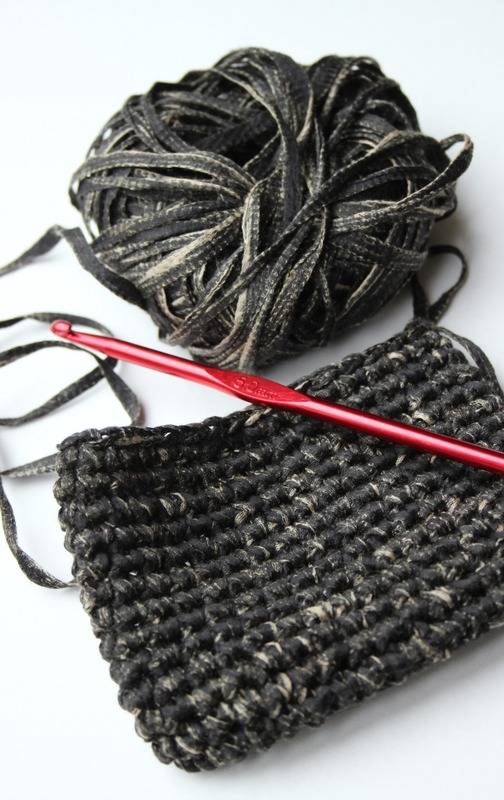 The yarn is a collaboration with Rowan Yarns, which I class as high-end yarn. 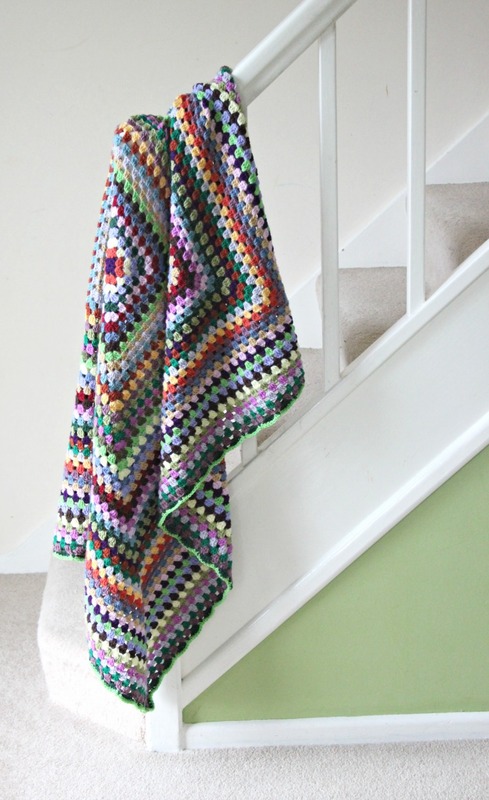 There are free patterns on the Rowan website for garments and shawls using this yarn. I couldn’t put my finger on what it reminded me of for ages. It’s marble! It reminds me of marble! There’s kind of an Art Deco quality to it, whether or not that was what was intended! I’ve made three little purses out of the two balls they sent me and I’ve made some snazzy tassels too. I’ve not put the zips on yet so I’ll come back with pictures when they’re done. 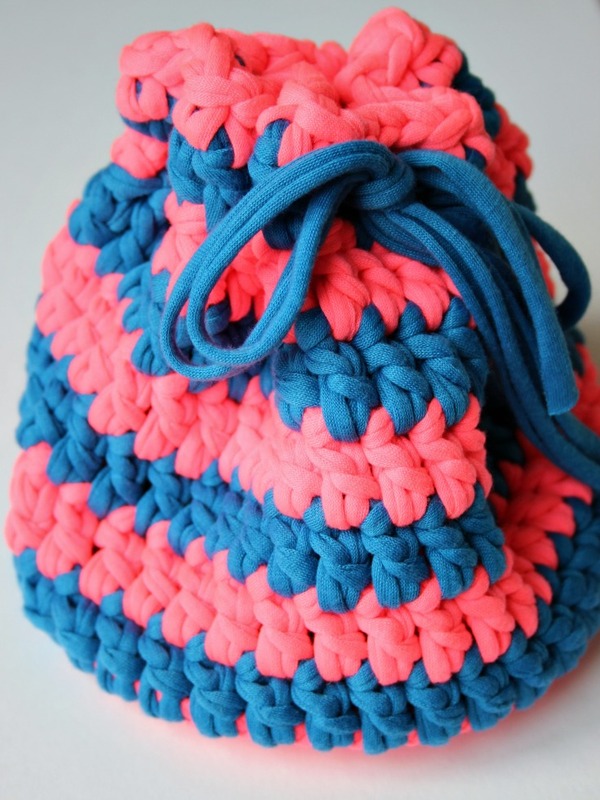 Next up is this cute little bag I put together. In half term the boys and I went on the bus to Exeter to visit the dentist (living the high life) and happened to fall into Tiger (I didn’t realise until yesterday that it’s actually called Flying Tiger!). I came out with two balls of t-shirt yarn and I won’t mention the bagful of other random stuff. I’ve briefly shown on Instagram and the vlog the spiral I started. 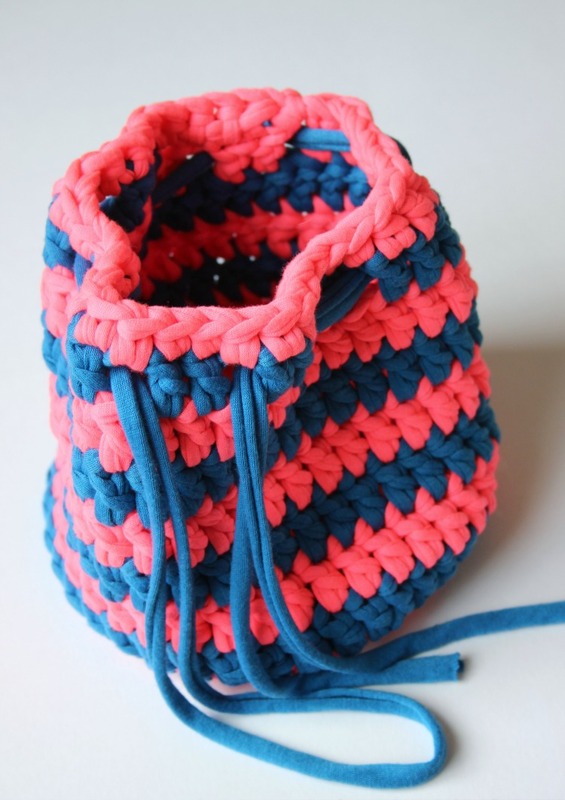 The spiral turned into a bag and the bag has turned into a written pattern! Just like that! Well, not just like that. 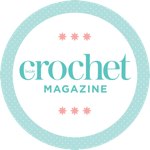 At this point I say a massive Thank You to my IG friends (including my fellow WordPress pals Eleonora of Coastal Crochet and Teresa of Shirley Rainbow) who tested the pattern for me. Majorly helpful, without you, the pattern would have been a mess , so thank you very much indeed!! Please go to Ravelry where the pattern is now live!! Wahoo! 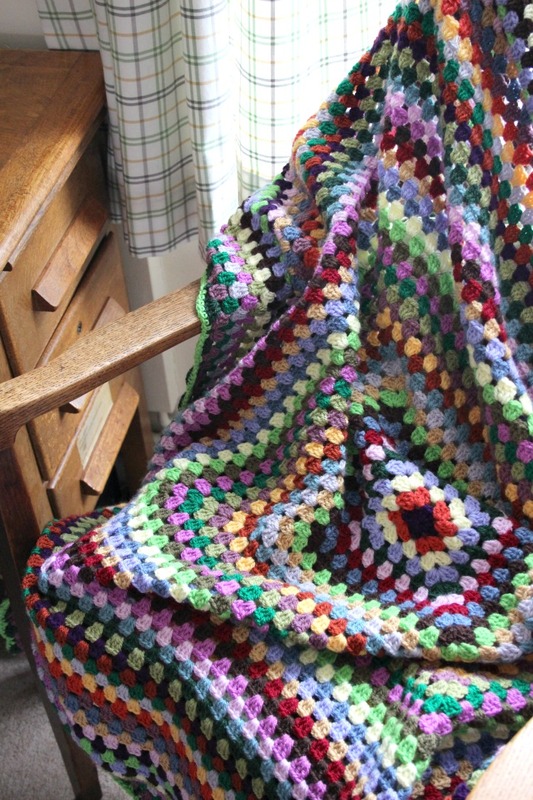 I’m now going to bombared you with pictures of a giant granny blanket…. This has been another stashbuster. I’m so happy to have finished it. I didn’t know it at the time but it was destined to become a birthday present for someone in the family. Stylecraft Spesh again. All the colours that had nowhere else to be but with each other. I rather like it. 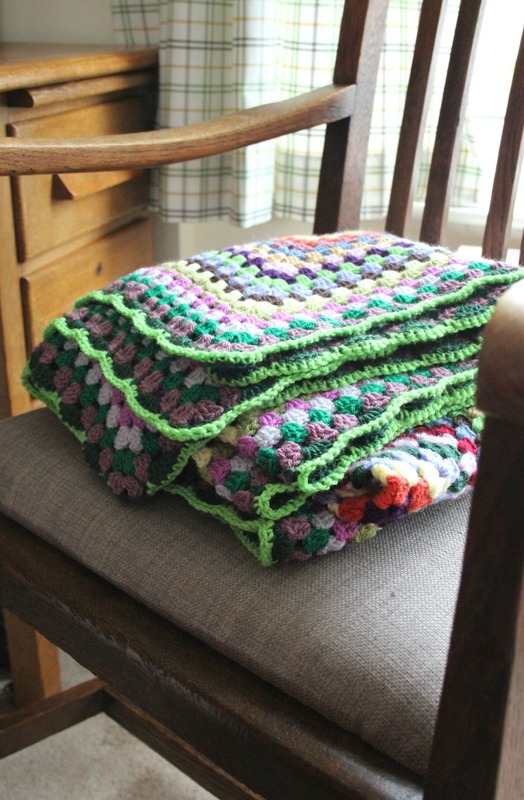 A proper Granny blanket, don’t you reckon?! Such is my commitment to getting this to its destination, I managed to drag myself to the post office even after I’d fallen over and torn a hole in Brand New Jeans!! A week later and Youngest boy is still asking why I fell over. Because I did. It was slippery, it was down a steep slope and I was wearing New Clothes. That’s why! There’s nothing quite like holding back your own tears whilst a boy of nearly four cries for cuddles with Daddy… because Mummy fell over. Oh, what have I done?! I vlogged myself!!! 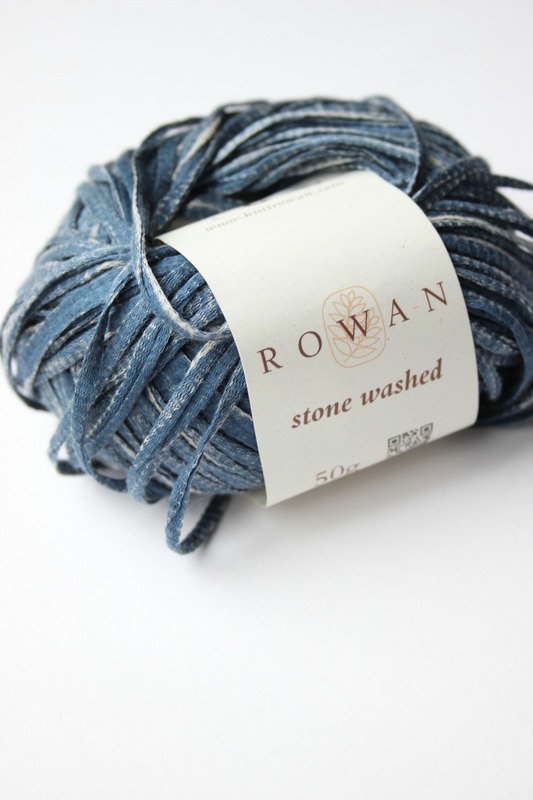 I’m liking that Rowan yarn , looks cool. I am destashing myself but of course I bought some debbie ( I cannot afford you ) bliss yarn last week . Thank you! It already feels like the vlog was a million years ago. I won’t leave it too long because it’ll feel weird all over again. I really liked your Vlog and can’t wait for next one (I’ve even subscribed to not miss it!). 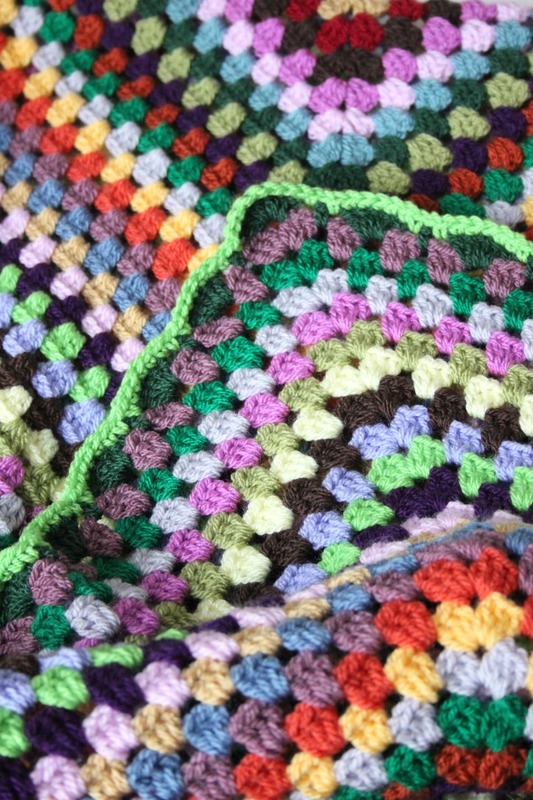 Lovely granny blanket, and the bag is awesome too, I was wondering what you were going to make with this spiral. Great idea! Kids eh! no use at all. I wish I’d been able to just sit but the wet ground was soaking into my trousers, the boy was crying and I dreaded being spotted. I tried as quickly as I could to get my bum off the floor and stagger home. Your fall must’ve been bad to be floored for so long. Not nice. Thank you! Hopefully there will be some in stock soon. It’s such a bargain. It really is! Mind you, you’re going to look so flippin’ cool in your ripped jeans… Last time I was shopping, I had to pretty much tear Topshop apart looking for a pair with unripped knees! Oh to find the perfect pair of jeans!